A new cotton mill in the north of England could help revive UK-based supply chains once production gets underway this autumn, spinning the highest quality yarn for high-end apparel. Last week just-style paid a visit to the mill, located in Greater Manchester. As part of a project by English Fine Cottons, a Grade II listed building is now home to what claims to be the most modern cotton mill in the world. The mill, which is the only commercial cotton spinner in the UK, is producing luxury yarn for the domestic and global markets and is adhering to its phase one plan: spinning 1,000 tonnes of cotton per year initially, with space and potential to expand up to 12,000 tonnes. The installed equipment comes from Saurer & Truzschler from Germany. 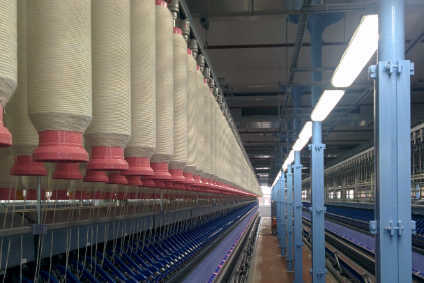 And in another first, English Fine Cottons is believed to be the first company in the world to have purchased a full end-to-end yarn manufacturing mill that includes technologies in carding, cleaning, combing and compact spinning, with fully automatic monitoring throughout the process. The company is also looking to potentially purchase further equipment from India. Tracy Hawkins, vice president of sales and marketing at English Fine Cottons, tells just-style the company is hoping to build a UK-based cotton supply chain through the new venture – and believes it is achievable to bring manufacturing back to the UK on a commercial scale. "The percentage of cynics I've met has been tiny," she explains. "A number of UK brands have built themselves up from this heritage of fabulous cotton fabrics produced in the UK and they would have liked to continue producing it here, but as soon as cotton spinning went abroad it just all became much more difficult. As much as they would have liked to buy British yarn, they couldn't, and the tide started to turn against British textile manufacturing." According to Hawkins, the company hopes to help reconnect a supply chain similar to that of the woollen and worsted industry in Yorkshire, which has managed to stay together despite now being somewhat smaller than its heyday at the end of the 19th Century. "I think what happened is many of these businesses which were left abandoned managed to survive either by diversifying or specialising and they've become very dependent on themselves, whereas in Yorkshire they still talk to each other and connect, and we must try and start that back up again and link those people back together in the cotton industry." Hawkins adds talks are ongoing with a "myriad" of potential apparel customers, many of whom are waiting for the mill to start producing yarns. Along with UK luxury fashion brands and department stores, the company hopes to work with UK retailer Marks & Spencer, which is interested in the mill's first batch of cotton. In addition, it is exploring an opportunity to export to Europe where the last, largest, cotton spinning mill in Switzerland recently closed. Hawkins says she is already receiving enquiries for fine yarns, as well as for fabrics made from English Fine Cottons yarns. "So not only are we going to be selling yarn, but a lot of customers want to buy fabric and some actually want to buy finished products as well," she explains. "We will be doing either a combination of commissioning ourselves or connecting manufacturers together who are able to make fabrics and products using our yarn." Supported by parent company and technical textile specialist Culimeta-Saveguard, the mill combs and compact spins extra long staple varieties of cotton, primarily US Supima alongside West Indies Sea Island Cotton and Indian Suvin cotton. Its primary Supima cotton is sourced from the largest cotton farm in the world and is renowned for its fantastic quality and consistency, Hawkins says. The mill will hold stocks of Suvin and Supima on-site in order to offer fabric makers the flexibility to obtain yarn when and where needed, rather than investing in large quantities from overseas. "If you're trying to supply a great quality yarn at the top end of the market you need to start with a really great quality raw fibre," she explains. "It's something we've been quite surprised at really; there seems to have been a loss of knowledge within the industry when cotton moved offshore, a lack of interest in the detail of fibre and quality of yarn manufacture. "What you actually build into the yarn gives you the quality [but] when I ask what fibre has been used it's quite often not even talked about. If you ask retailers or brands the source of their cotton they often wouldn't even know where it came from, which probably means it's a middling type or lower quality cotton that is able to give fast fashion an opportunity to get lower prices. Commercial cotton swamped the world, we almost lost sight of what a really good quality cotton was," she explains. Indeed, there is a pressing need in the apparel industry for more transparency on raw materials. And while brands such as Gap, C&A and Marks & Spencer are opting to go public with their main supplier factories, it is still difficult for a brand to know exactly where the raw cotton used in its products originates. Sourcing from English Fine Cottons will give brands complete supply chain transparency, from raw material to the finished garment, should the retailer opt to use the company's supply chain. Hawkins says English Fine Cottons is building relationships with suppliers and growers of all of its cotton from Sea Island to US Supima. And the decision to source more expensive raw materials such as these is key to the company's focus on quality. English Fine Cottons does not class speed to market as the utmost priority, choosing instead to value quality and identify with what she calls "slow fashion". "Yes, there always will be opportunities for speed to market but we probably would reverse that and say quality is number one for us," she adds, "then provenance and responsibility, then heritage, then sustainability. And then we get to the point where speed to market is important." The facility has benefited from substantial investment: around GBP4.8m of the businesses' own money, in addition to a GBP1m grant awarded by the Textile Growth Programme – the largest amount of its type ever awarded, says Hawkins. "There are certain levels of responsibility we have here. We've been handed the baton from the Textile Growth Programme to help support other businesses [and] at the moment we aren't turning anyone away," explains Hawkins. "We have got a responsibility to be out there and help build the market and support the rest of the textile industry in the UK and that's what we are trying to keep our minds open to do." And she says the group is not only working to boost the textile industry in the UK, but abroad too. It is currently supporting Sea Island Cotton in the West Indies to produce "larger crops with improved yield", working closely with the governments, West Indian Sea Island Cotton Association (WISICA) and growers in the region. Similar agreements and practices are also being developed with Indian cotton suppliers. Future investments are likely to include an open-end system to utilise the company's comber noil – a by-product of the yarn spinning process that is produced when cotton is combed to remove short fibres – and other recycled fibres. And it is also planning to invest in a new power generation plant, offering savings against market prices and long-term supply stability.